Thameslink commuters on the route between Cambridge and Brighton will benefit from 2,000 extra seats to and from the capital at peak times in the morning and evening through a new summer timetable. Mondays to Fridays from 20 May, Thameslink will be doubling the frequency of the new Cambridge-Brighton cross-London service so that two trains an hour will run in each direction. The extra trains will run for most of the day, giving passengers on the route from Cambridge, via Hitchin and Stevenage, new half-hourly services to and from Gatwick, as well as central London. In total, 31 additional services will run on weekdays, 13 of them in the peak and 29 of them on Thameslink with two extra off-peak services on Gatwick Express. Weekend Thameslink trains also receive a significant boost with 180 extra services on Saturday and 100 extra on Sunday. These are a combination of reinstated services (such as on the Bedford Main Line which returns to four trains per hour), new trains including Cambridge to Brighton on Saturdays and Cambridge to Gatwick on Sundays and a doubling of the trains from Rainham via Dartford and Greenwich both Saturday and Sunday. In direct response to customer requests, some weekday peak services will also make additional stops at places such as Preston Park on Gatwick Express, Hassocks on Southern and Knebworth and Letchworth on Thameslink. GTR Chief Executive Patrick Verwer said: “Thameslink’s new service between Cambridge and Brighton has been really well received by passengers. By doubling its frequency we’ll create seats for 2,000 more commuters each morning and evening and provide a further boost to the economies of these two important cities. “Leisure travellers will love the new service too: we’ll have half-hourly trains from the Cambridge route direct to London and Gatwick, and Thameslink will be much better at the weekends. Southern and Gatwick services are already running at intended levels so there are few changes. Passengers should check online at National Rail Enquiries for full details. An extra hourly Thameslink service will run between Cambridge and Brighton, adding to the hourly service introduced last year. This will provide a 30 minute service direct between the two cities calling at Royston, Ashwell & Morden*, Baldock, Letchworth Garden City, Hitchin, Stevenage, Finsbury Park, London St Pancras International, Farringdon, City Thameslink, London Blackfriars, London Bridge, East Croydon, Gatwick Airport, Three Bridges, Haywards Heath, Burgess Hill, Hassocks* and Preston Park*. From Cambridge the service will run hourly between 0525 and 1824 and from Brighton between 0538 and 1838, providing additional carriages to and from London on these lines. An additional 0713 Kings Cross to Cambridge Thameslink service will also run, providing 29 new services overall. *At Ashwell & Morden the Cambridge – Brighton service will be half-hourly in the peak and hourly off peak. At Hassocks and Preston Park this Cambridge – Brighton service will replace stops on the current Bedford – Brighton service. On Gatwick Express, an earlier 0430 service from London Victoria to Gatwick Airport will be introduced, as will a 0541 Gatwick Airport to London Victoria. Great Northern will operate a rail replacement bus service between Watton-at-Stone and Stevenage to replace weekday train services from 20 May while Network Rail works on the Stevenage train turnback facility. The project will deliver a fifth platform at Stevenage and associated infrastructure. Once completed, the train turnback will enable the separation of Hertford Loop train services from the East Coast main line improving reliability and allowing for an increase in services in this area. 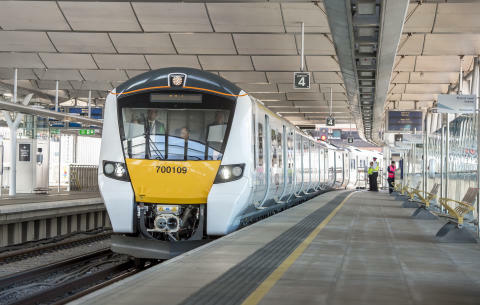 Thameslink services will be significantly enhanced including direct services between Cambridge, Gatwick Airport and Brighton on Saturdays and between Cambridge and Gatwick Airport on Sundays, connecting the East Coast and Brighton main lines at weekends for the first time. This service will call at Royston, Baldock, Letchworth Garden City, Hitchin, Stevenage, Finsbury Park, London St Pancras International, Farringdon, City Thameslink, London Blackfriars, London Bridge, East Croydon, Gatwick Airport, Three Bridges, Haywards Heath, Burgess Hill, Hassocks and Preston Park. The Bedford route will see two more trains per hour to London, and on to Gatwick Airport or Three Bridges, restoring a 15 minute frequency. This service will call at Flitwick, Harlington, Leagrave, Luton, Luton Airport Parkway, Harpenden, St Albans City, London St Pancras International, Farringdon, London Blackfriars, London Bridge, Norwood Junction, East Croydon, Purley, Redhill, Earlswood, Salfords, Horley and Gatwick Airport. To Three Bridges on Sundays the Bedford service will call at Flitwick, Harlington, Leagrave, Luton, Luton Airport Parkway, Harpenden, St Albans City, West Hampstead Thameslink, London St Pancras International, Farringdon, London Blackfriars, London Bridge, Norwood Junction, East Croydon, Purley, Redhill, Earlswood, Salfords, Horley and Gatwick Airport. The Kentish Town to Rainham route will increase from one to two trains per hour. The Sunday Sutton to London Blackfriars service is re-timed and will continue to St Albans (after 12 noon) calling additionally at Kentish Town, West Hampstead Thameslink, Cricklewood, Hendon, Mill Hill Broadway, Elstree & Borehamwood and Radlett. There are no significant changes planned to Southern, Great Northern or Gatwick Express at weekends.